Previous How do you know you have Dry Eyes? Your eyes are a very sensitive organ (not that I need to tell you that), and require constant lubrication in order to function properly. Your tear film is incredibly important for maintaining the health of the surface of your eye and also for good, STABLE vision. Matter of fact, your tear film is the MOST IMPORTANT optical surface of your eyes. Because vision is based on light coming into your eye and then focusing on your retina, the FIRST thing that light hits is your TEAR FILM! If your tear film is abnormal then your vision will be poor. Your tears are also important for the overall health of your eyes. Not only do they provide lubrication and a clear optical surface but they help to prevent infections by removing bacteria from the surface. What is Tear Film? Your tear film is like a sandwich that sits on the very surface of your cornea (the front clear part). Your baseline normal tear film is produced around the clock while you’re awake. Every time you blink, your tears are pushed into the normal drain on your eyelids and a new layer is put down. You blink 10-11 times a minute if you were curious. There are 3 different layers of your tear film which are produced by different cells on and around your eye. Each layer has a different function and an issue with any or all of the layers will lead to dry eye symptoms. To understand dry eye syndrome, it is important to have at least a basic understanding of the different tear layers, where they come from and what they do. The mucin layer of your tear film is the thinnest layer and is produced by Goblet Cells that live in your conjunctiva (the transparent membrane that covers the white part of your eye). We have goblet cells everywhere in our bodies (lungs, GI tract, etc..) and their sole purpose is to produce mucus. The mucin layer is the first layer of your tear film that sits directly on the cornea. It is sticky and acts as a good “base” for your tear film to adhere to the surface. It can also fill in small microscopic defects to help maintain a smooth optical surface for good, stable vision. It is vital for a stable ocular surface. As we age, the goblet cells on the conjunctiva become damaged and the mucin layer of our tears becomes increasingly more dysfunctional. 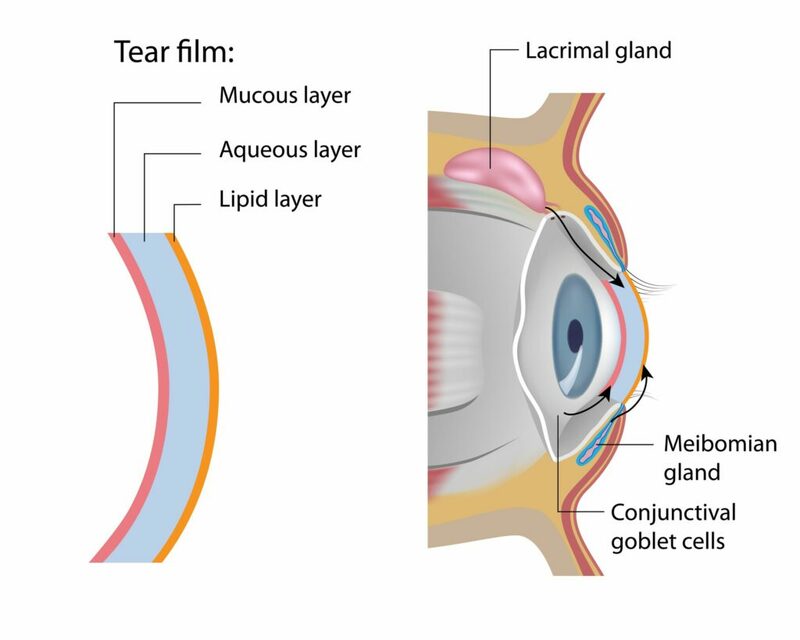 The aqueous layer is the thickest layer of your tear film and is produced by your lacrimal gland. The lacrimal gland is located above your eye, below your eyebrow towards your ear. It’s only purpose is the production of your watery tear film layer. This is what is activated when your eyes get itchy and watery with allergies and when you cry while watching Bambi. This layer can be affected by infections, nerve damage and constant exposure (difficulty blinking). The lipid layer is the top layer of your tear film. It is situated on the surface and is exposed to the environment. The oily layer helps to reduce evaporation of the watery layer. It’s kind of like putting olive oil in a pot of water, it takes longer for it to boil. This layer is produced by glands in the eyelid called Meibomian Glands (don’t worry, you don’t need to remember that). The lipid layer can be affected by any number of things that can also affect the eyelids such as rosacea, dermatitis, infections, etc…. 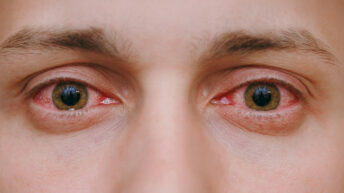 A deficiency in this layer causes the tears to look milky which, as you can imagine, makes good vision impossible. As a general rule, Dry Eye Syndrome is an instability of the tear film caused by a deficiency in one or all of these layers. The symptoms are pretty much the same no matter what layer is affected. The only way to tell which layer is causing the most problems is by having a good eye exam with special testing. Once we know which layer(s) is affected most, it directs our therapy. Regardless of which layer is responsible for your dry eye, inflammation is the underlying cause of most of not all of your symptoms. As you can imagine, inflammation is causing the glands to produce tears that do not work as well as they should, so the tears that are produced have “inflammatory chemicals” in them. These inflammatory chemicals cause the eye to be even more irritated which in turn causes more inflammation, and so forth and so on…. The longer it goes intreated, the worse it gets. It’s like a toxic soup that baths your eyes everyday. Classically, Eye Doctors tended to ignore DES until it became so bad that patients were miserable on a daily basis. We would give artificial tears and just say “you’re just getting older”. 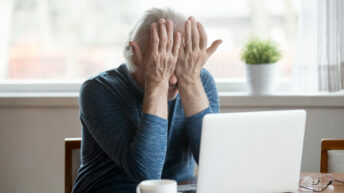 Those days are gone and all cases of Dry Eye should be taken seriously because the consequences for not taking action can be pain and blurred vision, which aren’t a lot of fun….